WINNIPEG - The Winnipeg Blue Bombers are having a little fun with a controversial comment from Calgary Stampeders coach Dave Dickenson. 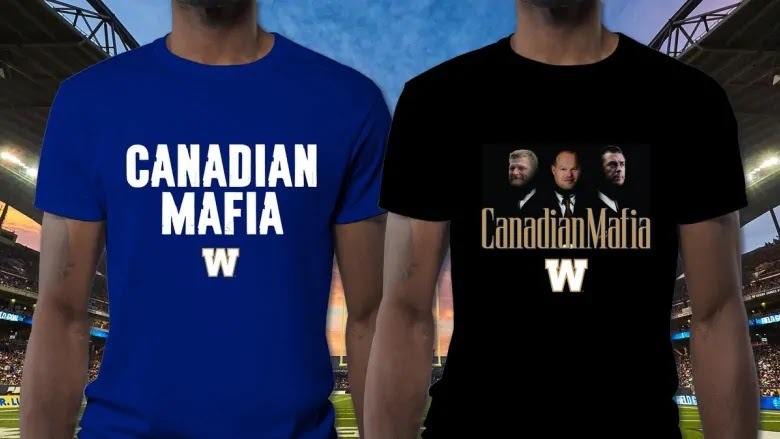 The Bombers tweeted Friday that they are producing two 'Canadian Mafia' T-shirts, one of which features pictures of head coach Mike O'Shea, team president Wade Miller and general manager Kyle Walters - all of whom are Canadian. During the West final between Calgary and Winnipeg, television cameras caught Dickenson shouting '(expletive) Canadian' while questioning why some calls were being made in front of O'Shea. Dickenson has since apologized for the comment. When you cant win, distract? Good for Winnipeg, might as well have fun with it and make a buck. I find it ironic that the "@#$%&%# Canadian Mafia" statement came from Calgary. The team that had the vision and fortitude to hire Marc Mueller.